You Save: $5.49 (25%) Ships in 1 day. Publisher: Liberties Press, Dublin, 2007. Soft Cover, 173 pages, 4.50 x 6.75. In recent years, the Irish public has become ever more sophisticated and well travelled, and with this has come a growing interest in food and drink. We have become more adventurous in our tastes, both when going out and when entertaining at home. 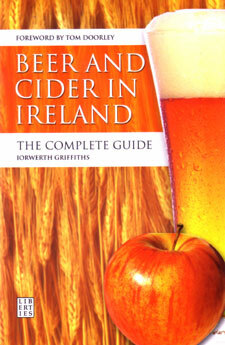 Beer and Cider in Ireland: The Complete Guide is the first book of its kind to discuss all the beers and ciders produced in Ireland and their outlets such as the Porterhouse, as well as the increasing number of eclectic overseas brews that are available in our shops and off licences. The book covers all the breweries and cidermakers of Ireland, north and south, from the major international companies to the numerous microbreweries that have sprung up in recent years. The history of each brewery and cidermaker is outlined, the main beers and ciders produced by them are described, and notes on appreciating the drinks are provided. Overall, this is essential reading for everyone who is interested in the wide range of beers and ciders produced and sold in Ireland, and in the country's rich traditions of brewing and cidermaking. Iorwerth Griffiths is originally from Wales but is now based in Belfast. He� has written for a number of drinks publications including Malt Advocate and Whisky magazine. In the course of his research he has travelled around Ireland and met the people who run and work in the major Irish breweries and the growing number of microbreweries.